This is an adapted transcript of a talk I gave at Promcon 2018. 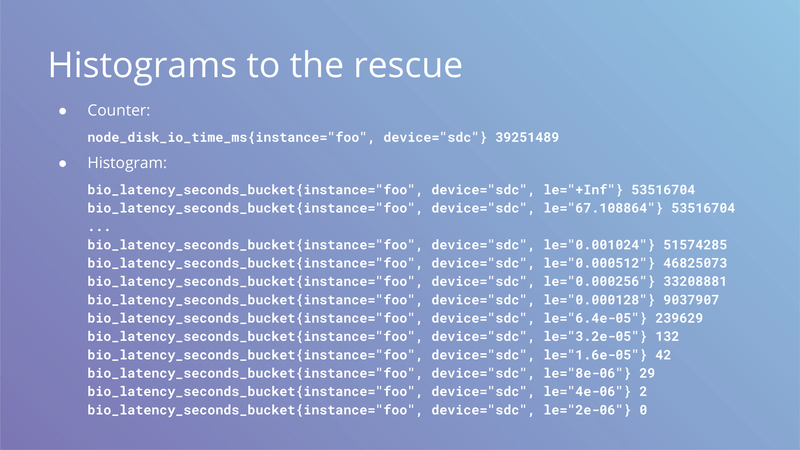 You can find slides with additional information on our Prometheus deployment and presenter notes here. There’s also a video. Tip: you can click on the image to see the original large version. 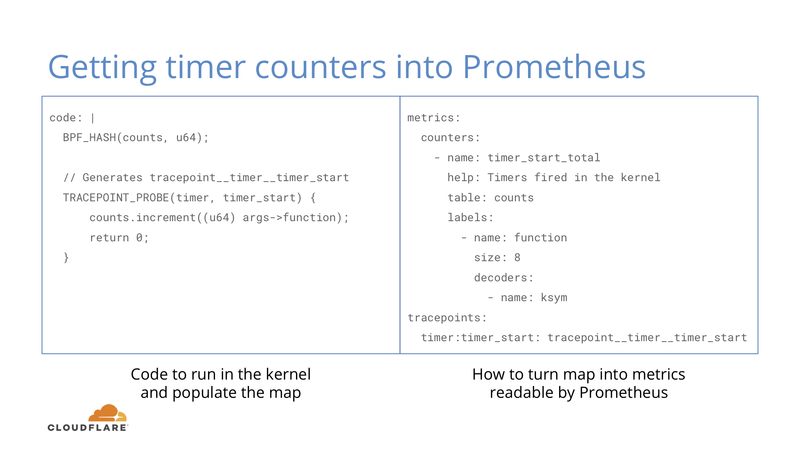 Here at Cloudflare we use Prometheus to collect operational metrics. 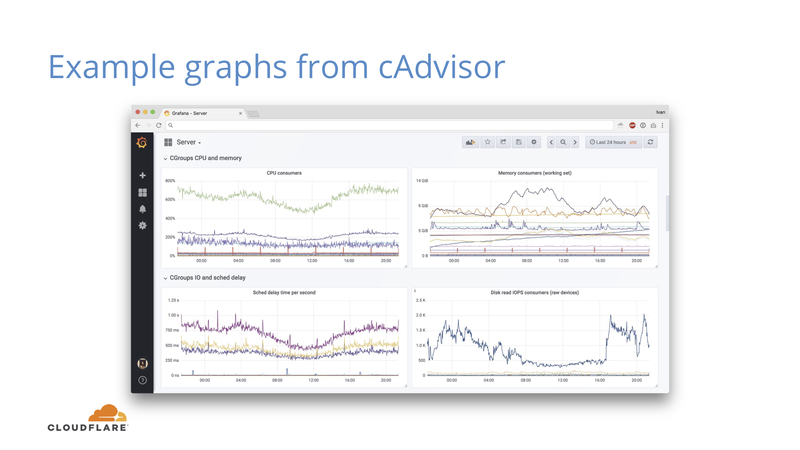 We run it on hundreds of servers and ingest millions of metrics per second to get insight into our network and provide the best possible service to our customers. 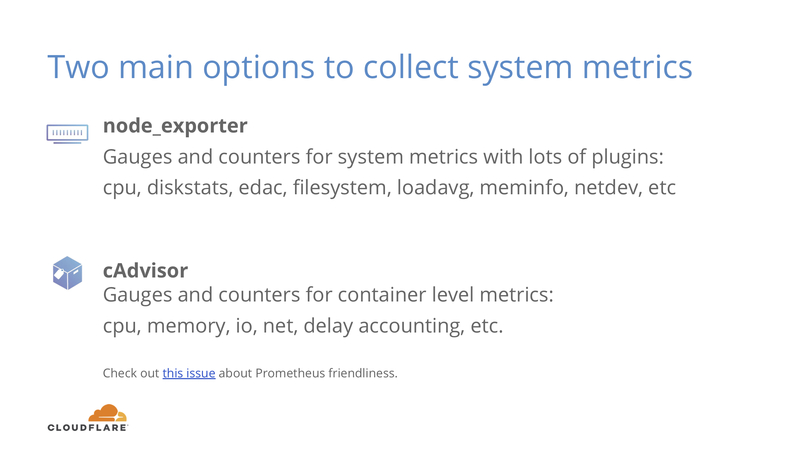 Prometheus metric format is popular enough, it’s now being standardized as OpenMetrics under Cloud Native Computing Foundation. It’s exciting to see convergence in long fragmented metrics landscape. 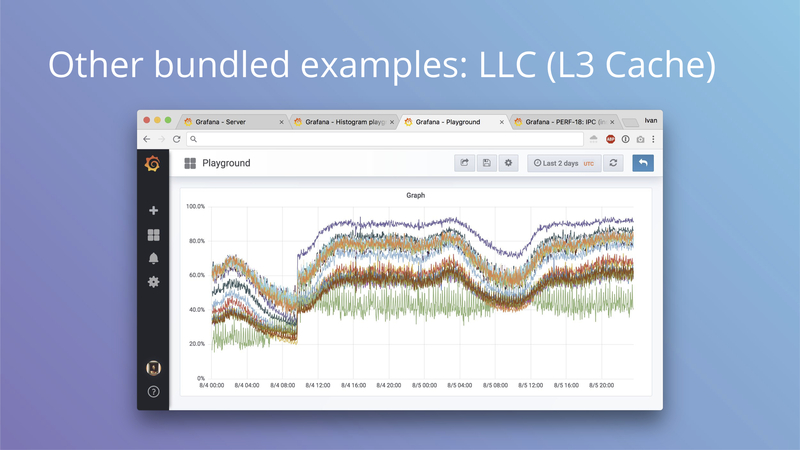 In this blog post we’ll talk about how we measure low level metrics and share a tool that can help you to get similar understanding of your systems. I should mention that every screenshot in this post is from a real production machine doing something useful. We have different generations of hardware, so don’t try to draw any conclusions. If global CPU numbers do not change much, you can still see shifts between services. All of this information comes from the simplest counters and first derivatives (rates) on them. Counters are great, but they lack detail about individual events. Let’s take disk io for example. 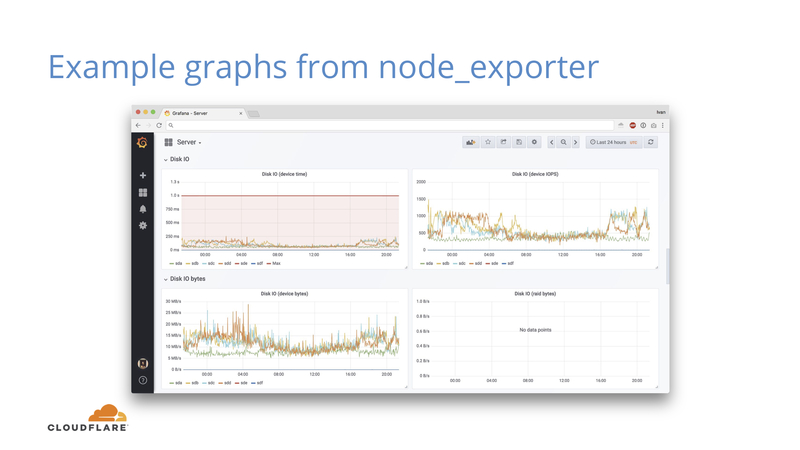 We get device io time from node_exporter and the derivative of that cannot go beyond one second per one second of real time, which means we can draw a bold red line at 1s and see what kind of utilization we get from our disks. We get one number that characterizes out workload, but that’s simply not enough to understand it. Are we doing many fast IO operations? Are we doing few slow ones? What kind of mix of slow vs fast do we get? How are writes and reads different? 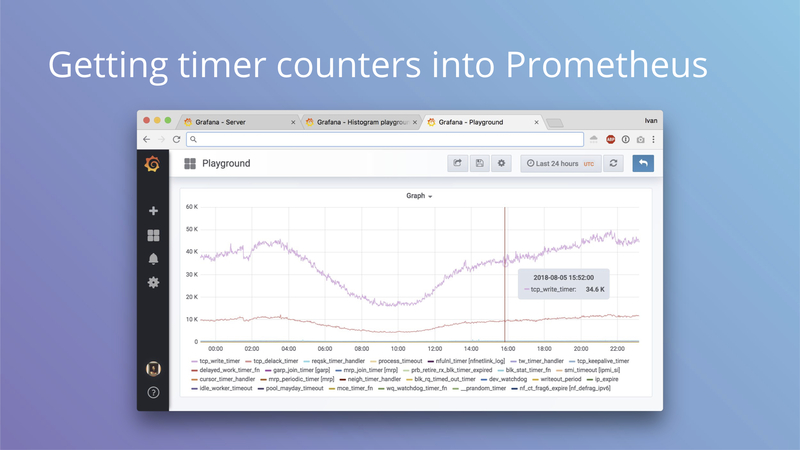 Keep in mind that Prometheus histograms are cumulative and le label counts all events lower than or equal to the value of the label. Okay, so imagine we have that histogram. 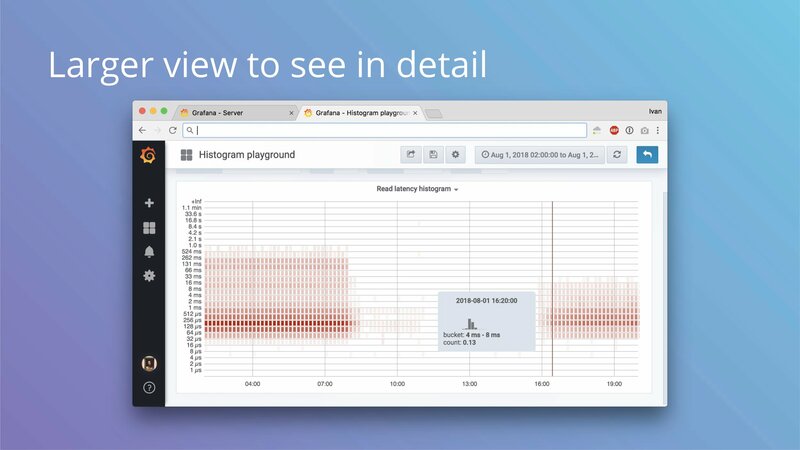 To visualize the difference you get between the two types of metrics here are two screenshots of the same event, which is an SSD replacement in production. We replaced a disk and this is how it affected the line and the histogram. 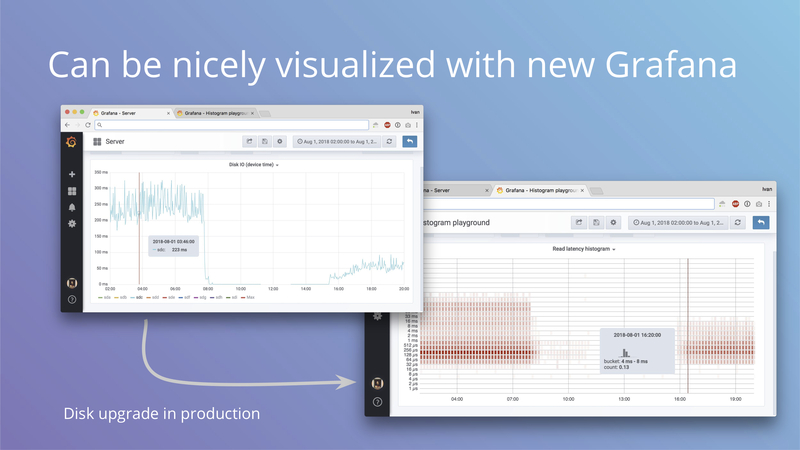 In the new Grafana 5 you can plot histograms as heatmaps and it gives you a lot more detail than just one line. Here you can see buckets color coded and each timeslot has its own distribution in a tooltip. It can definitely get easier to understand with bar highlights and double Y axis, but it’s a big step forward from just one line nonetheless. In addition to nice visualizations, you can also plot number of events above Xms and have alerts and SLOs on that. For example, you can alert if your read latency for block devices exceeds 10ms. Tech specs for the left disk give you 50 microsecond read/write latency and on the right you get a slight decrease to 36 microseconds. That’s not what we see on the histogram at all. Sometimes you can spot this with fio in testing, but production workloads may have patterns that are difficult to replicate and have very different characteristics. Histograms show how it is. Even a few slow requests can hurt overall numbers if you’re not careful with IO. 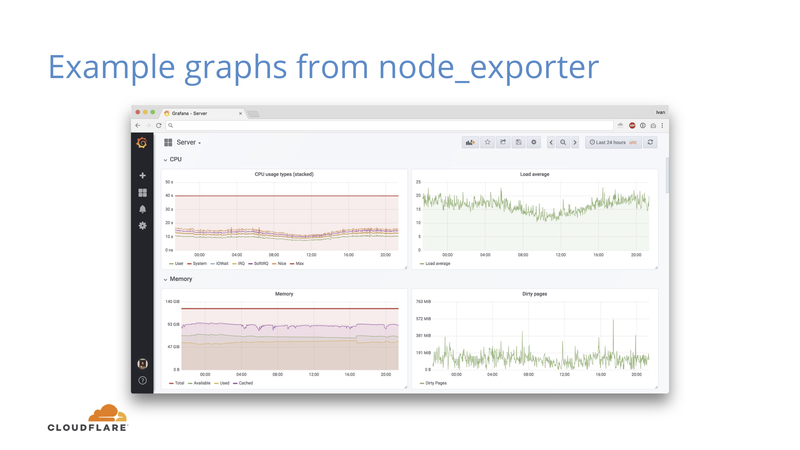 We’ve blogged how this affected our cache latency and how we worked around this recently. From summary statistic’s point of view every box on the right is same, but if you plot individual events, a very different picture emerges. These animations are from the same research, here you can clearly see how box plots (mean + stddev) are non-representative of the raw events. We established that histograms are what you want, but you need individual events to make those histograms. 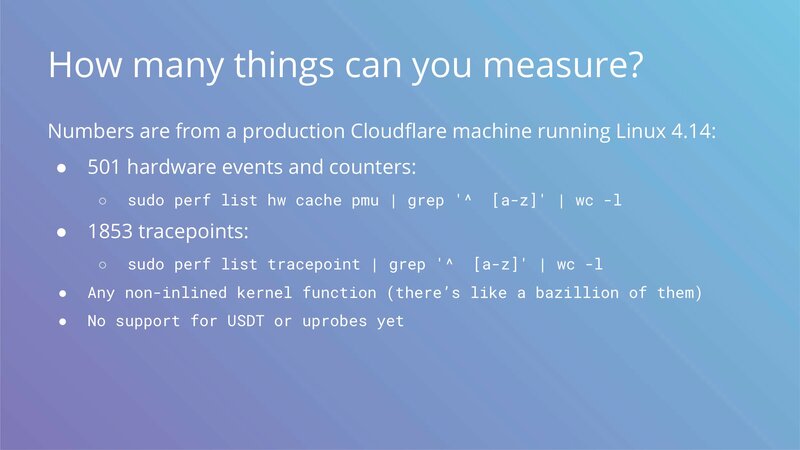 What are the requirements for a system that would handle this task, assuming that we want to measure things like io operations in the Linux kernel? 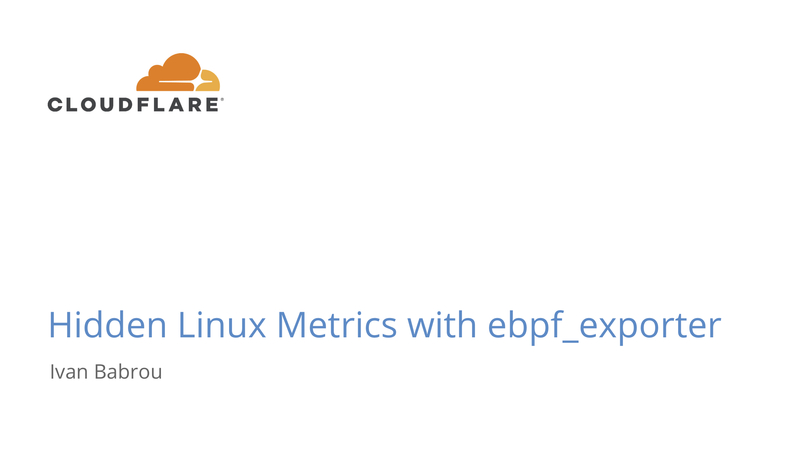 And it turns out, there’s a solution called eBPF. 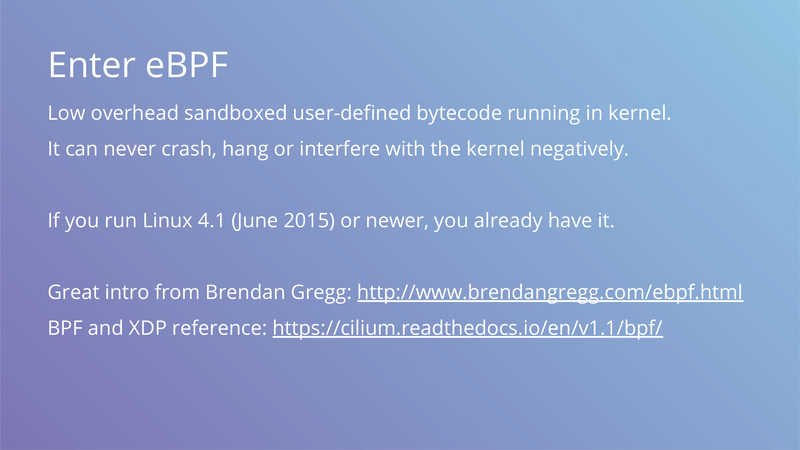 It’s a low overhead sandboxed user-defined bytecode running in the kernel. It can never crash, hang or interfere with the kernel negatively. That sounds kind of vague, but here are two links that dive into the details explaining how this works. The main part is that it’s already included with the Linux kernel. 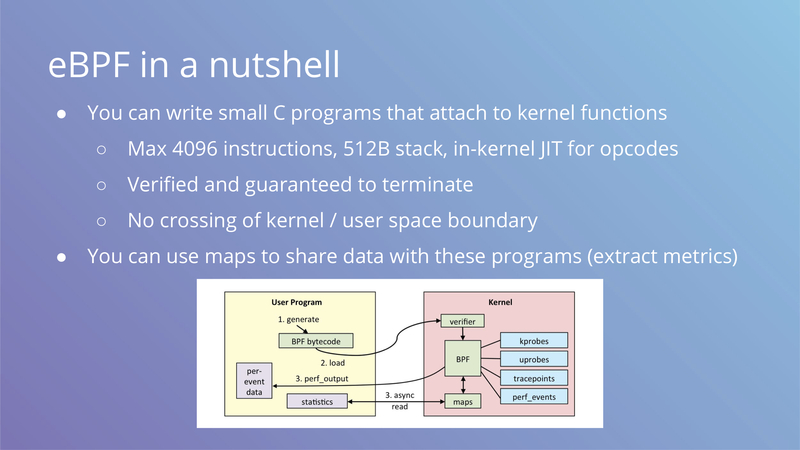 It’s used in networking subsystem and things like seccomp rules, but as a general “run safe code in the kernel” it has many uses beyond that. 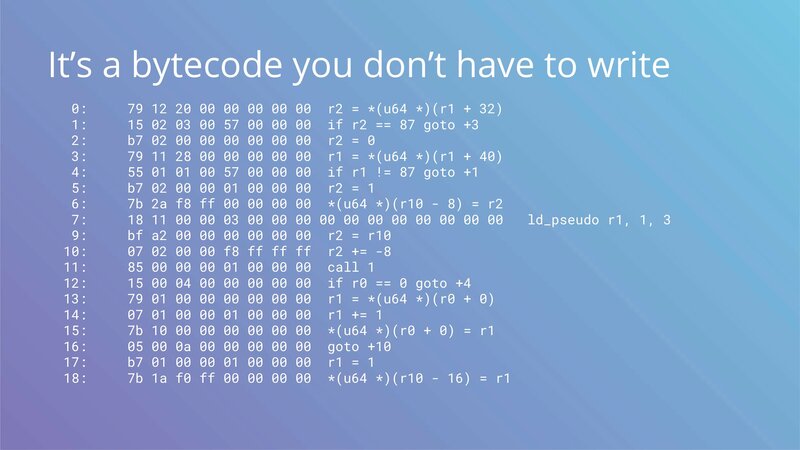 We said it’s a bytecode and this is how it looks. The good part is that you never have to write this by hand. You can see the workflow on the image above. Having to write C is not an eBPF constraint, you can produce bytecode in any way you want. There are other alternatives like lua and ply, and sysdig is adding a backed to run via eBPF too. 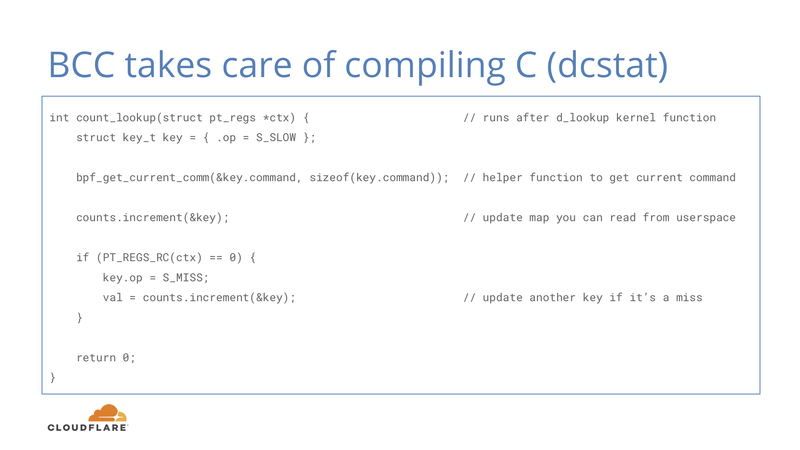 Maybe someday people will be writing safe javacript that runs in the kernel. In this example we have a simple function that runs after d_lookup kernel function that is responsible for directory cache lookups. It doesn’t look complicated and the basics should be understandable for people familiar with C-like languages. The one above is biolatency, which shows you a histogram of disk io operations. That’s exactly what we started with and it’s already available, just as a script instead of an exporter for Prometheus. 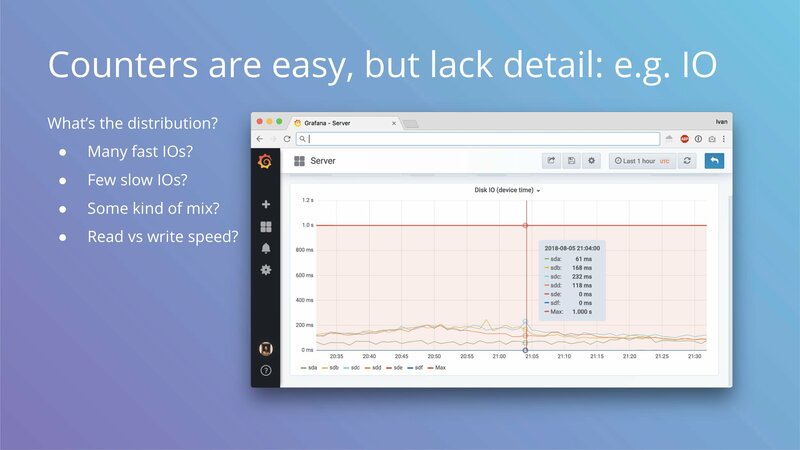 The more you know about disk io, the more you want to run stateless, really. Sadly, RAM prices are not going down. Okay, now to the main idea of this post. 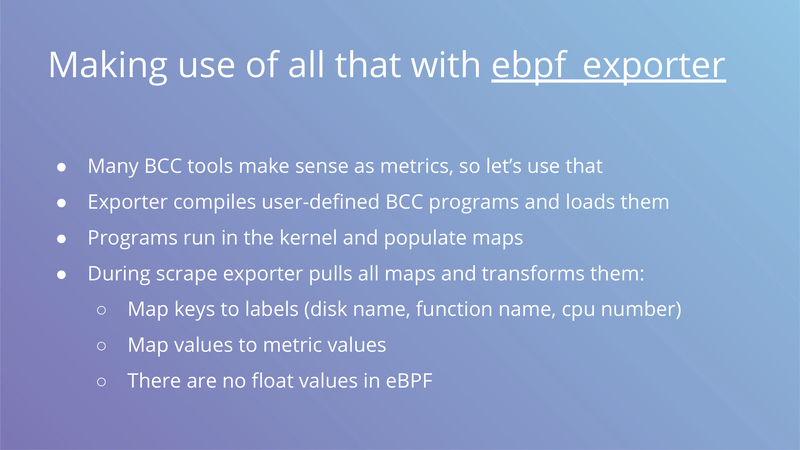 We have all these primitives, now we should be able to tie them all together and get an ebpf_exporter on our hands to get metrics in Prometheus where they belong. 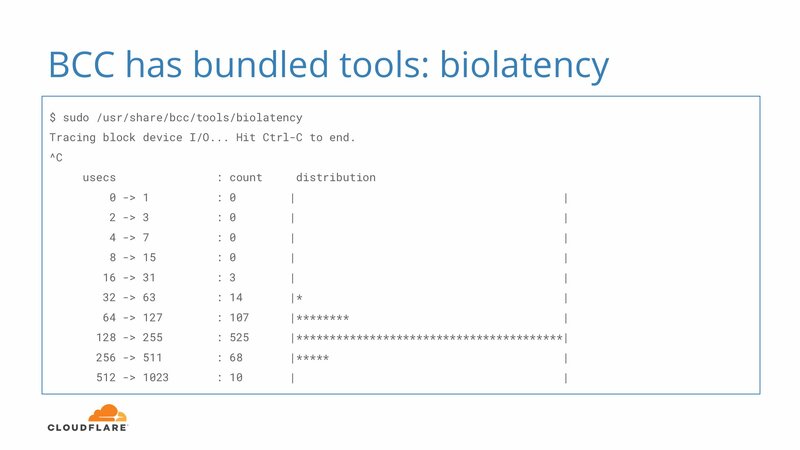 Many BCC tools already have kernel side ready, reviewed and battle tested, so the hardest part is covered. 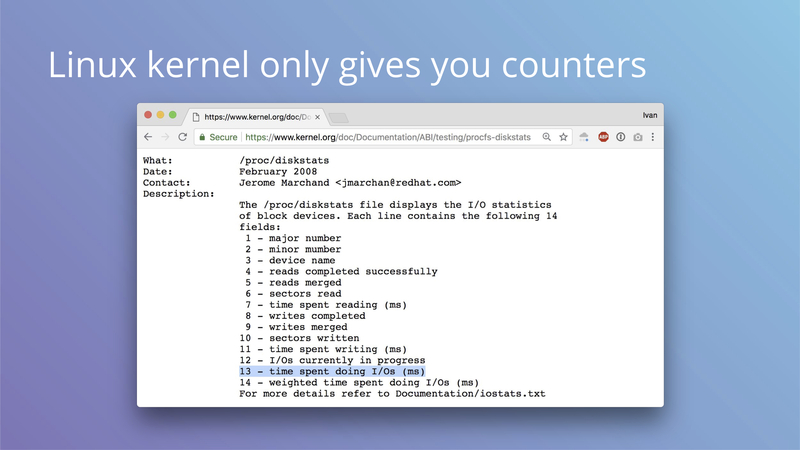 Let’s look at a simple example to get counters for timers fired in the kernel. 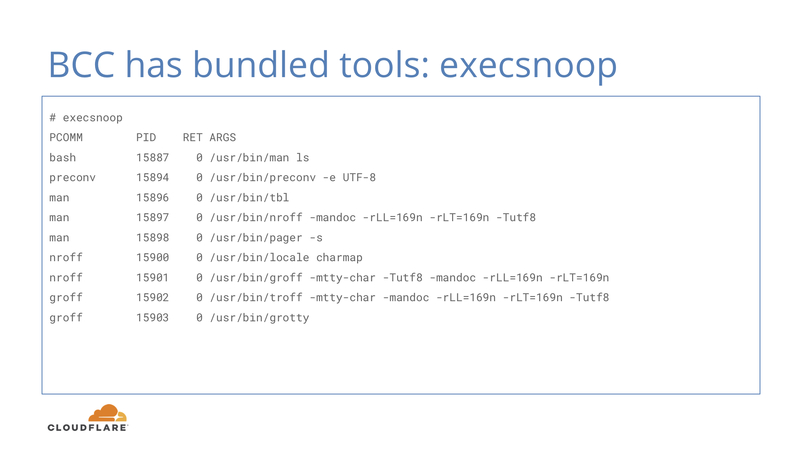 This example is from the ebpf_exporter repo, where you can find a few more complex ones. On the BCC code side we define a hash and attach to a tracepoint. When the tracepoint fires, we increment our hash where the key is the address of a function that fired the tracepoint. On the exporter side we say that we want to take the hash and transform 8 byte keys with ksym decoder. Kernel keeps a map of function addresses to their names in /proc/kallsyms and we just use that. We also define that we want to attach our function to timer:timer_start tracepoint. Why can this be useful? You may remember our blog post about our tracing of a weird bug during OS upgrade from Debian Jessie to Stretch. 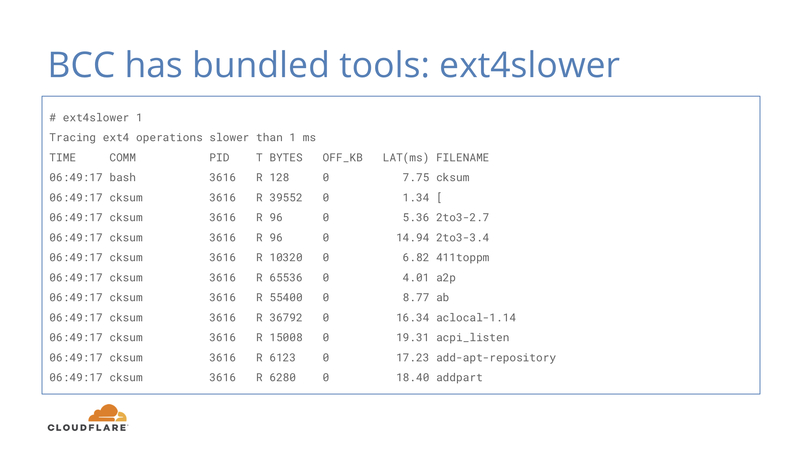 TL;DR is that systemd bug broke TCP segmentation offload on vlan interface, which increased CPU load 5x and introduced lots of interesting side effects up to memory allocation stalls. You do not want to see that allocating one page takes 12 seconds, but that’s exactly what we were seeing. Why can this be useful? You can see how your CPU cache is doing and you can see how it may be affected by bigger L3 cache or more cores sharing the same cache. This is also a histogram, but now for run queue latency. When a process is woken up in the kernel, it’s ready to run. If CPU is idle, it can run immediately and scheduling delay is zero. 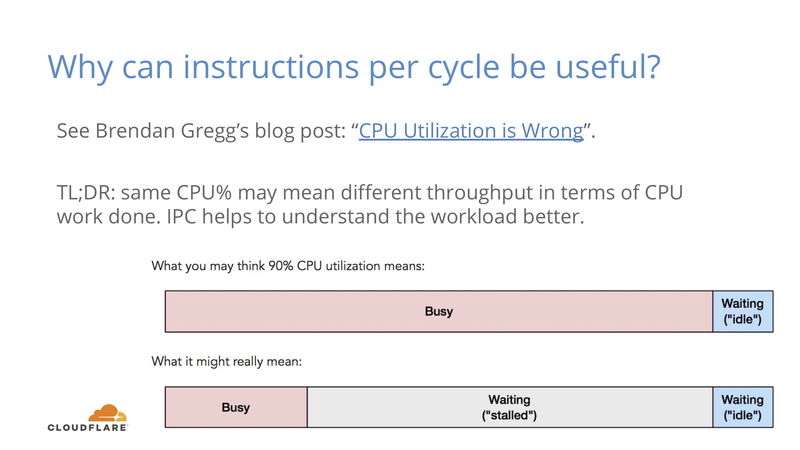 If CPU is busy doing some other work, the process is put on a run queue and the CPU picks it up when it’s available. That delay between being ready to run and actually running is the scheduling delay and it affects latency for interactive applications. Understanding of how you can be delayed is important for understanding the causes of externally visible latency. 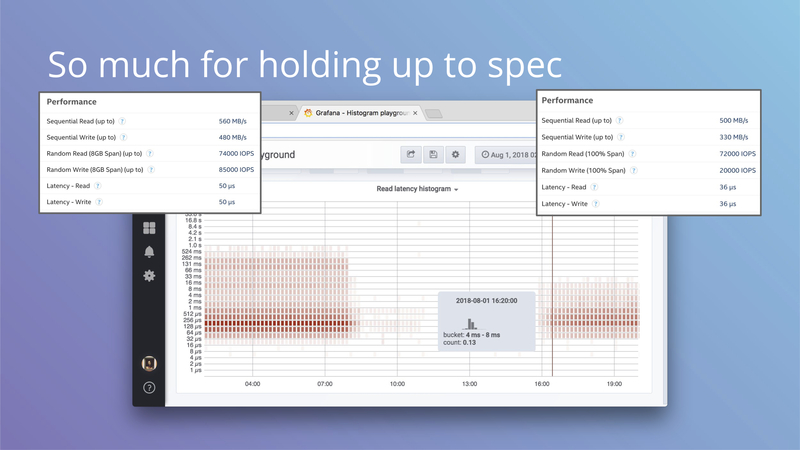 Check out another blog post by Brendan Gregg to see how you can further trace and understand scheduling delays with Linux perf tool. It’s quite surprising how high delay can be on even an even lighty loaded machine. It also helps to have a metrics that you can observe if you change any scheduling sysctls in the kernel. The law is that you can never trust internet or even your own judgement to change any sysctls. If you can’t measure the effects, you are lying to yourself. There’s also another great post from Scylla people about their finds. We were able to apply their sysctls and observe results, which was quite satisfying. The examples we gave are not the only ones possible. 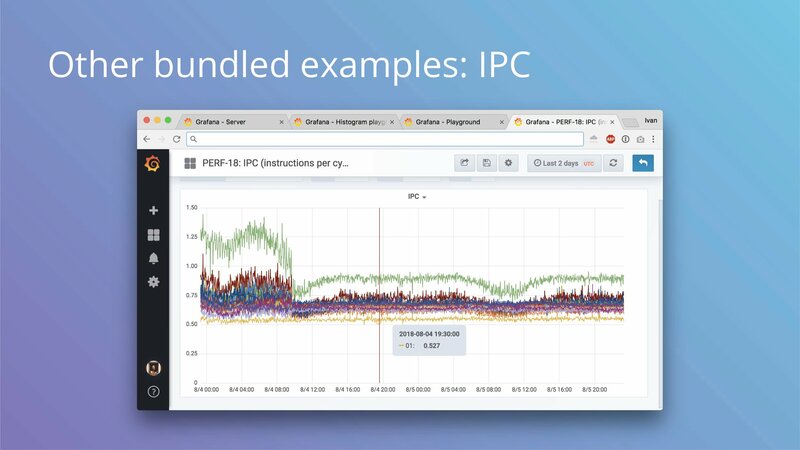 In addition to IPC and LLC metrics there are around 500 hardware metrics you can get on a typical server. 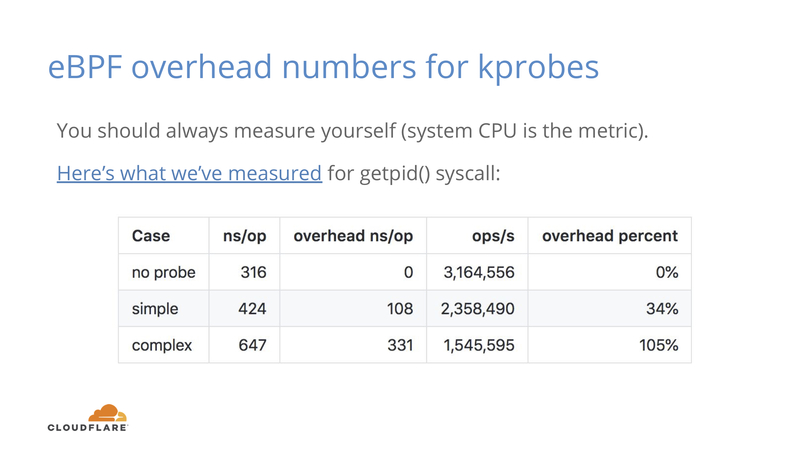 And you can always trace any non-inlined kernel function with kprobes and kretprobes, but nobody guarantees binary compatibility between releases for those. Some are stable, others not so much. We don’t have support for user statically defined tracepoints or uprobes, which means you cannot trace userspace applications. This is something we can reconsider in the future, but in the meantime you can always add metrics to your apps by regular means. For a fast getpid() syscall you get around 34% overhead if you count them by PID. 34% sounds like a lot, but it’s the simplest syscall and 100ns overhead is a cost of one memory reference. For a complex case where we mix command name to copy some memory and mix in some randomness, the number jumps to 330ns or 105% overhead. We can still do 1.55M ops/s instead of 3.16M ops/s per logical core. If you measure something that doesn’t happen as often on each core, you’re probably not going to notice it as much. 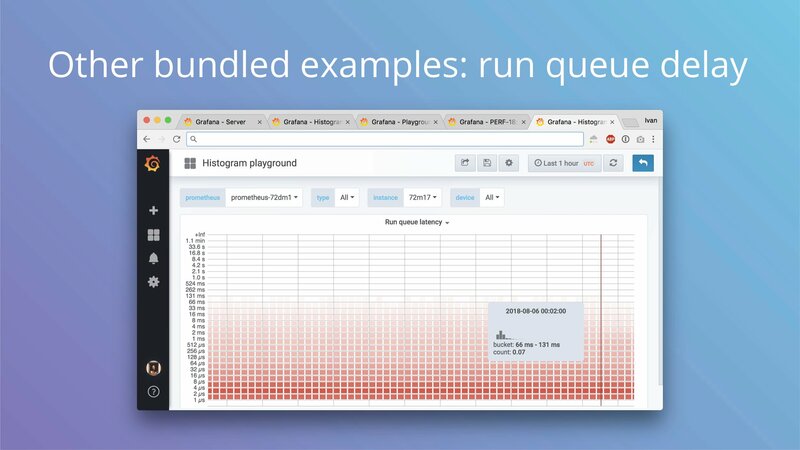 We’ve seen run queue latency histogram to add 300ms of system time on a machine with 40 logical cores and 250K scheduling events per second. So where should you run the exporter then? The answer is anywhere you feel comfortable. 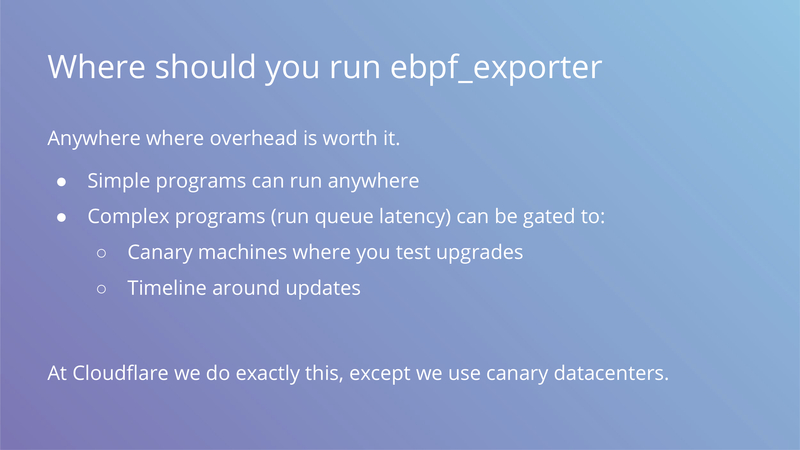 The last thing we wanted to mention is that ebpf_exporter is open source and we encourage you to try it and maybe contribute interesting examples that may be useful to others. While this post was in drafts, we added another example for tracing port exhaustion issues and that took under 10 minutes to write.